The Nob Hill Deep Seating set includes five seating options and two table options. The seating options include a one-person lounge chair, a one-person rocking lounge chair, a two-person love seat, a three-person sofa and an ottoman. The surface options include a small end table and a larger coffee table. Each piece is available individually so that you might handpick the perfect configuration for your outdoor room. The Nob Hill collection is characterized by angular table and chair legs, slatted seatbacks and angled armrests. The tables are topped with glass tabletops, and the seats and seatbacks are made comfortable with plush outdoor cushions. The frame finishes and cushion fabrics are customizable by you, and Woodard has a generous selection to choose browse below. 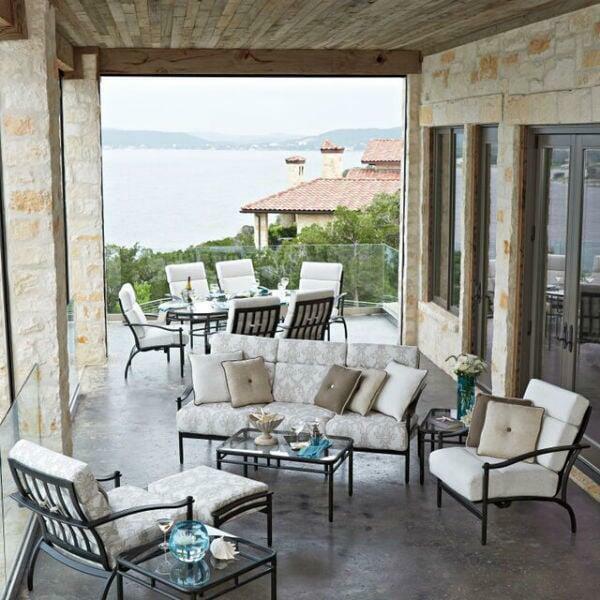 All finishes and fabrics are made specifically for all-weather outdoor placement. Love Seat 34.25" D x 54.5" W x 36.25’? Sofa 34.25" D x 78" W x 36.25"